Je le poste quand même en cop/coll car il constituera un important élément de référence et il serait fâcheux qu'il disparaisse avec le tempos comme c'est trop souvent le cas. basis, and we hysterically, and tongue-in-cheekly, dubbed it "the scariest chart ever"
as of today, total US Debt, is $14.942 trillion (source), obviously an all time high. Q2 GDP as was reported by the BEA three weeks ago, was $15.012 trillion in current dollars. 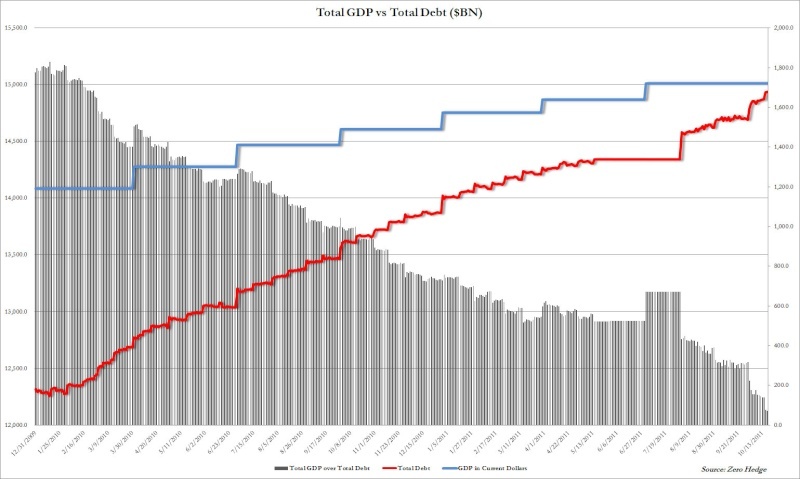 In other words, the spread between total GDP and total debt has now collapsed to an all time low $70 billion. will officially surpass GDP on Halloween 2011. Just as we thought the circus was over if only for a few weeks. 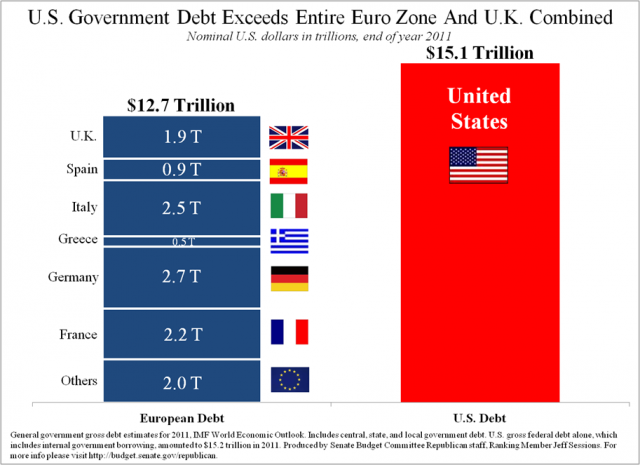 Also, this means that in a few days, the US debt ceiling will be raised from $15.194 trillion to $16.394 trillion. As a reminder, US GDP was just revised down to $15.176 trillion. Not even an hour after we asked the question, The Hill gives us the answer: "The Obama administration will be asking Congress to raise the debt limit in the coming days, White House press secretary Jay Carney said on Tuesday. "I'm confident it will be executed in a matter of days, not weeks," he told reporters. The notification by the administration — which had been scheduled for last month — was delayed because Congress has been holding only pro forma sessions. The White House will be asking Congress to raise the U.S. borrowing limit by $1.2 trillion. The move would mark the third and final increase from the debt-ceiling deal reached last year by Congress." Of course, the optics of yet another debt-ceiling increase, even a preapproved one, are simply horrible during campaign season. But such is life. Here is the kicker though: the US has preapproval for $1.2 trillion in debt issuance, as per the August 2011 agreement. So far so good. The problem is that since then the US has issued $900 billion in debt in five short months! In other words, somehow the remaining buffer of just $300 billion, or a final debt ceiling of $15.5 trillion, is supposed to last the US until after the presidential election, because this topic flaring up just before Obama is due to hit the debate circuit will be reelection suicide. So our question is: how will the US, which has a gross debt issuance rate of over $100 billion per month on average, last for a year with just $300 billion in dry powder? And even if the $1.2 trillion count begins from the new request, it still means the new debt ceiling will be breached some time in August/September, as we expected last year when we did the calculation assuming a $180 billion gross issuance per month ($900 billion in 5 months). We can't wait to hear the OMB's explanation. WASHINGTON — President Barack Obama asked Congress Thursday for another $1.2 trillion increase in the nation’s debt limit, a request that is largely a formality but which carries election-year implications. It was the third and final such request the president was allowed under a deal the White House reached with lawmakers in August to prevent a government default. Congress has 15 days to reject the president’s request. Majority House Republicans, eager to criticize the president’s spending policies, immediately announced they would hold a vote next week on a resolution of disapproval. But such a resolution would not clear the Democratic-led Senate, and the White House says Obama would veto an objection, anyway, in order to avoid default. Obama originally planned to make this request in December, but with Congress on vacation until mid-January, lawmakers asked the president to delay his request so they could vote on the matter when they returned. "Washington’s mounting debt is a drag on our economic recovery, and this request is another reminder that the president has consistently punted on the tough choices needed to rein in the deficit and protect important programs for American seniors from going bankrupt," said Brendan Buck, spokesman for House Speaker John Boehner, R-Ohio. The increase would boost the debt limit to $16.4 trillion, which should be enough to allow the government to keep borrowing until the end of 2012, or just after the presidential election. The debt limit is the amount the government can borrow to finance its operations. It has soared because the government has run record deficits over the past decade. In August, Congress and the administration agreed to raise the borrowing limit by $2.1 trillion in three steps. The deal was reached hours before a potential default on the nation’s debt. Congress agreed to raise the debt limit by $400 billion in August and by another $500 billion in September. vers le 20 janv. la dette US officielle se situait aux portes des 15.194 trillions - depuis les US se sont rattrapés puisqu'elle se situe autour de 15.570 presque 0.5 trillions au dessus du PIB inflaté. Sans Q3 le PIB risque de s'essoufler sérieusement et donc de faire bondir la dette/PIB. Geithner lache le morceau ! il ne conteste nullement les 20 ou 50 trillions de dollars et finit par lacher :ce sera beaucoup et ça vous rendra très inconfortable ! les chiffres réels de la dette us, existante sont bien plus elevés que les 16 trilliards de la version officielle , qui sont de l'ordre de 100 trillions de $ ! 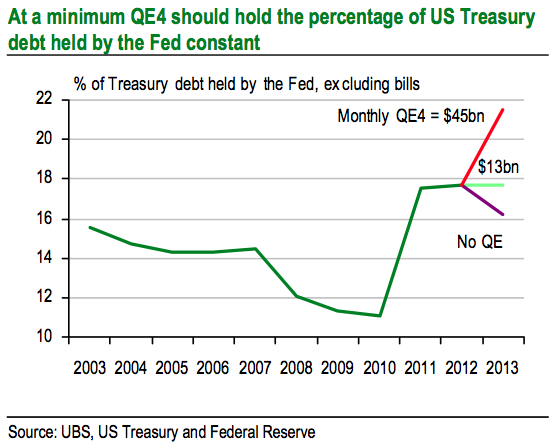 The REAL direct Treasury/Taxpayer guaranteed debt number right now is at LEAST $25 trillion. This includes the $16.2 Trillion current limit PLUS the $7 Trillion in FNM/FRE Goverment guaranteed debt PLUS the Treasury bonds sitting in the Social Security Trust ($2.5 trillion last time looked). I have not included a lot of other small off-balance-sheet guarantees like GMAC (now called Ally) debt, Fed assets which are direct off-balance-sheet liabilities of the Treasury/Taxpayer and some other stuff. I would bet real money that the REAL number is closer to $30 Trillion. This does not include the GAAP accounting for the all of the future entitlement and welfare obligations. The net present value of this - i.e. if the Government had to account for its numbers like a corporation does - is more like $100 Trillion. That is not my estimate. That is a number that comes from David Walker, the former chief of the Congressional Budget Office. On a yearly GAAP accounting basis, the Government spending deficit is more like $5 trillion (see John Williams' Shadowstats.com). The $100 trillion is how a corporation would have to account on its balance sheet for its future obligations given what is known about future spending escalations and future estimated funding of that spending. That would be the number on the balance sheet reported in a corporation's 10Q/10K. As Europe's boats list uselessly in the storm, few seem to care that the US Titanic is taking in even more water!.. As the Crisis in Europe continues unabashed with Spain looking to slip below the water line any day, the US Dollar is continuing to find a number of bids and this is seemingly putting further pressure on our favourite metals in the near term,.. However this really is just jumping from one burning ship to another,..
We all know now that the Western Financial System’s kaput and given it’s the life blood of our indebted economies it’s rendered the entire Sovereign block bust as well,.. What this means is that management cannot cure this patient, only default will ultimately solve the problem,.. But an uncontrolled default of any sort would likely close the entire collection of Western banks doors forever, so the decision has been made to default through the back door,.. The Electronic Printing Press,.. This ultimately means there’s still a monstrous right down to come to every sovereign paper currency within this block,.. But the most exposed is ultimately the US Dollar with far more trouble on it’s books than anyone else,..
Insurance lies in Gold, Silver and Agricultural Land,.. The former of which are seemingly being sold at heavy discount at present!.. - de ZH : la dette fédérale US vient de passer les 16 trillons (milions de millions) d'USpesos, moins d'un an après avoir passé les 15 T$. - de Mish : la FED a fait un bénéf de 46,5 Milliards d'USpesos au 1er semestre, entièrement reversé au Trésor Public US, en jolie hausse sur les 40.5 du 1er semestre 2011. Comme la FED achète à tour de bras (ceux qui font tourner ses rotatives électroniques) la dette publique US, il n'est pas étonnant de voir ces deux chiffres progresser de concert : plus il y a de dette et plus la FED en achète, et plus elle en rembourse les intérêts au Trésor Public (après avoir payé ses menues dépenses) ; tout comme si le Trésor Public empruntait à taux zéro sur cette partie. prochain plafond de 16.394 T USD soit fin novembre. Si ca interresse ... Et merci à vous les Hard-Investor ! QE4 annoncé pour mercredi prochain? les initiés avaient vu juste ! QE4 ==> 45 $ milliards supplémentaires d'achats de bons trésor US, par mois ! Le président des Etats-Unis Barack Obama a signé lundi la loi sur la suppression provisoire du plafond de la dette publique. En vertu de ce document d'ici le 19 mai l'administration des Etats-Unis sera exemptée de la nécessité de demander au Congrès l'autorisation de dépasser le plafond de la dette publique établi actuellement à hauteur de 16 400 milliards de dollars. Selon les experts, au cours de cette période la barre sera franchie à hauteur de quelque 450 milliards de dollars. La Chambre des représentants américaine, à majorité républicaine, votera mardi pour relever le plafond de la dette sans conditions, a annoncé son président, une capitulation politique qui devrait écarter le risque d'un défaut de paiement après le 27 février. Un dénouement consensuel dans le dossier du plafond de la dette conforterait des accords historiques sur le budget entre démocrates et républicains en décembre et janvier, et mettrait ainsi fin à trois ans de blocage politique à Washington. Le président républicain de la Chambre John Boehner a annoncé mardi à la presse le dépôt d'une proposition de loi autorisant le Trésor à emprunter au-delà de la date limite du 27 février, sans que les républicains ne réclament de contreparties. Il n'a pas précisé jusqu'à quand, mais plusieurs élus évoquaient la date de mars 2015. Le vote a ensuite été officiellement programmé à mardi, à partir de 23H15 GMT. La limite légale de la dette, suspendue en octobre après une rude bataille parlementaire, a été réactivée vendredi dernier, et le Trésor a prévenu qu'il ne pourrait tenir que jusqu'à la fin du mois sans une nouvelle autorisation d'emprunter de la part du Congrès. Sans un vote des deux chambres du Congrès d'ici cette date limite, les Etats-Unis risquent de faire face à un défaut de paiement, duquel ils se sont déjà dangereusement rapprochés en octobre dernier, ainsi qu'à l'été 2011. Mais en acceptant de ne pas conditionner la suspension de la limite de la dette à des mesures chères aux conservateurs, les républicains se rangent à la position démocrate, qui exigeaient un texte "propre". Les chefs de file ont été forcés de constater qu'ils ne disposaient pas du soutien unanime de leur groupe pour se lancer dans une confrontation avec la Maison Blanche et le Sénat, à majorité démocrate, marquant une défaite cinglante pour le groupe d'élus du Tea Party. "Nos élus ne sont pas très enthousiastes à l'idée de relever le plafond de la dette", a déclaré John Boehner. "Et donc nous laisserons les démocrates apporter les voix nécessaires. Nous apporterons le minimum de voix requises pour que la loi soit adoptée". M. Boehner espère que les 200 représentants démocrates voteront pour le texte, et qu'au moins 18 républicains se joindront à eux, ce qui pourrait s'avérer délicat. Les démocrates ont immédiatement crié victoire. "La Chambre a compris que suivre la droite dure sur le plafond de la dette n'avait aucun sens, ce qui est bien pour la Chambre, bien pour le parti républicain et bien pour l'Amérique", a déclaré le sénateur démocrate Charles Schumer. Si la Chambre votait en faveur de la loi mardi, le Sénat aurait amplement le temps d'adopter la mesure d'ici le 27 février. Techniquement, le Congrès a décidé que le plafond de la dette ne s'appliquerait plus jusqu'au 15 mars 2015. Le Trésor pourra donc emprunter à volonté et dépasser la limite légale de la dette, actuellement de 17.211 milliards de dollars, jusqu'à cette date-là. Le 16 mars 2015, le plafond sera réactivé au niveau d'endettement alors atteint. la fin de l'hégémonie US et du dollar ?